A collection of rituals, blessings, and meditations to aid you in connecting with Source, deities and archetypes. Annually, on the Friday at 12noon of Sunset Campout, we gather as a community to kick things off with Opening Ceremony. 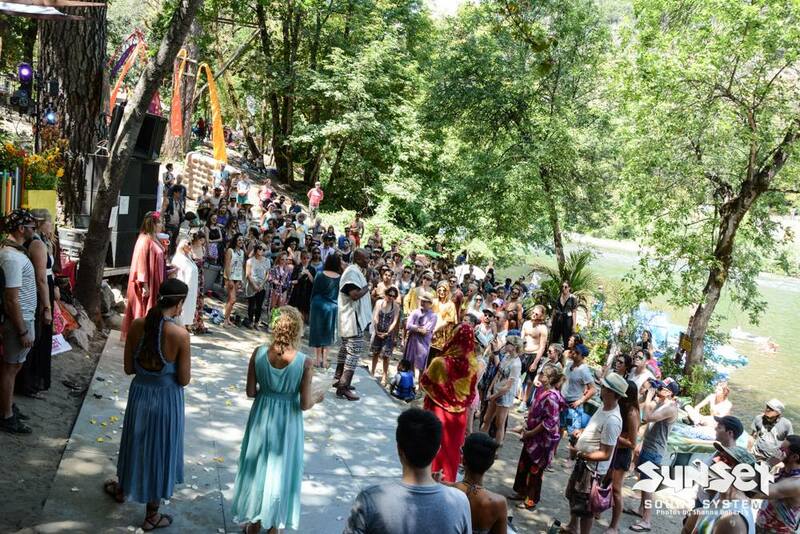 We do this to bring everyone together to reunite, connect with the elements, and to reinforce the importance of awareness to the environment. Opening Ceremony is designed to remind us of our duty to care for and protect the earth, and to ignite and empower our spirits to shine bright. Opening Ceremony performed by: Shaman Durek, Living Fae (Melanie Dawn & Anne Elizabeth), Anna Scott, Lois Langevin-King, Ursula Young, Bali Cloutman, Alexandra Sargent, Galen, Solar & Crew with special guest Danny Goldberg on the Gong. Start with taking three deep breaths to ground, center and connect with the elements. Everyone face the East, feel your feet firmly planted in the ground. Stretch your arms way up in the air and take a deep breath in, hold it and vibrate the sound “AUM”. Calling forth the Spirit Animals of the Mountains and Air, powers of knowledge, wisdom and imagination. I bring the blessings of the Air. Let the wind lift you up, into the sky. Fly amongst the clouds, climb mountains high. Tell your story, share wisdom from travels afar. Live your dream and shoot for the stars! Everyone turn to face the South, put your hands on your Belly and take a deep breath in and vibrate the sound of the belly “VAM”. Calling forth the Phoenix of the Fire. Rise up, powers of creativity, passion and desire. I bring the blessings of the Fire. Transform yourself and spark the flame. Celebrate life, be wild, untamed. Dance! Be free! Explore your passions. Then unleash it, in the wildest fashion! Calling forth the Mother Goddess of the Water elementals to vibrate the powers of unconditional love, appreciation and intuition. I bring the blessings of the Water. Listen closely to the rushing, Feather River flow. Feel the love that we’ve come to know. Be drenched in its joy, and appreciation for you. Then follow your heart, in all that you do! Turn and face the North with hands facing down towards the Earth. Take a deep breath, and vibrate the sound “LAM”. Calling forth the Faeries and elementals of Earth. Powers of prosperity, sustainability, and nature magic. I bring the blessings of the Earth. See nature’s beauty, connect with its grounding support. Hear the drumming of her big beating heart. Protect it, with your best intention. And show you care deeply, for nature’s perfections. We are Living Fae. Calling forth Spirit divine, knowledge of higher consciousness, ecstasy and bliss. Spread your wings, and shine your light. Love flows through you, all day and night. Dance among the moonbeams, feel the sun’s rays. Then follow your Will, and lead the Way. The earth is good to me! Words (c)2016 Faerie Art Enterprises. Photos (c)2016 Sunset Sound System Inc. Photos taken by Robin Russel & Karl Doyle. 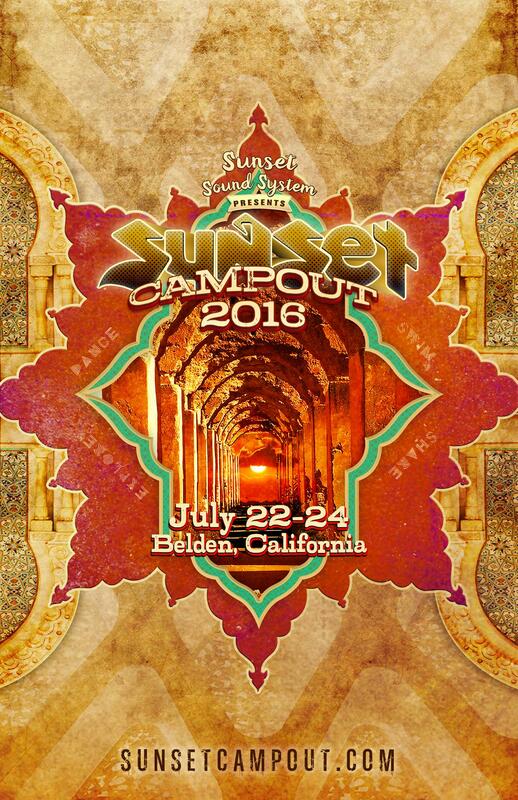 See you at Sunset Campout July 22 – 24! After much envisioning, planning and organization we are excited to see Belden Town, CA transform once again into Sunset Campout, for another magical weekend in the woods. 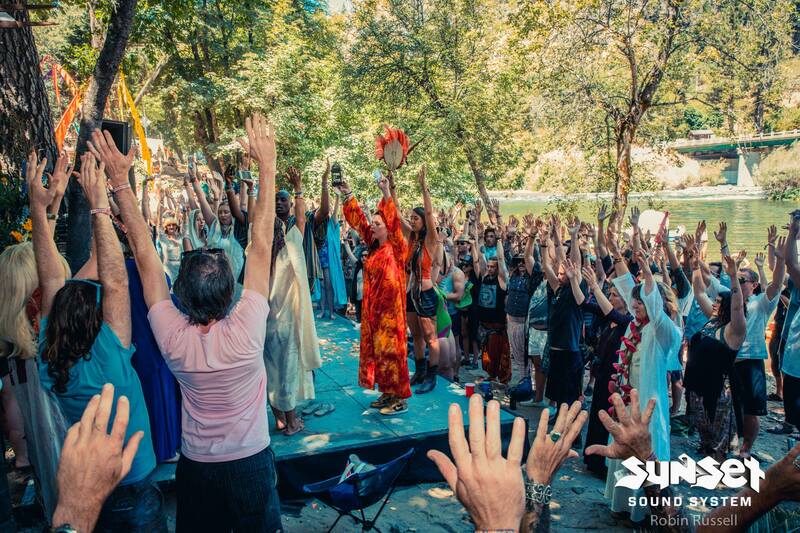 Join us on July 22 – 24th for our 2016 celebration to gather and dance outside in the sunshine and beneath the moonlit starry sky along the enchanting Feather River. This year we are abstractly weaving in alchemic mystical elements into our thought processes and creations, as we honor the nomadic ritual of generous hospitality from the ancient near east. We began designing altars for Sunset Campout back in 2002. 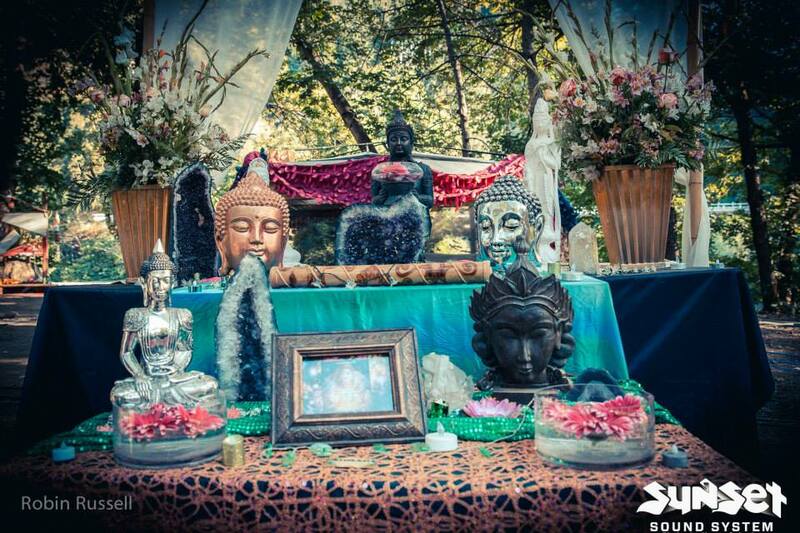 The Main Altar, located on the side of the main dancefloor, is there as a graceful reminder to respect and to serve as a sacred space for blessings, meditation, reflection and to spark connection with that which is greater than us. This years altar is inspired by a Jain communal ritual in which a stone sculpture is anointed over the course of four days. Devotees pour various offering substances in the form of blessings and prayers over the figure. The Sunset Campout main altar will be adorned with a stone Ganesh, remover of obstacles, and campout attendees are invited to participate by pouring their blessings and prayers over the sculpture. Offerings in the form of sacred herbs and flowers will be provided. 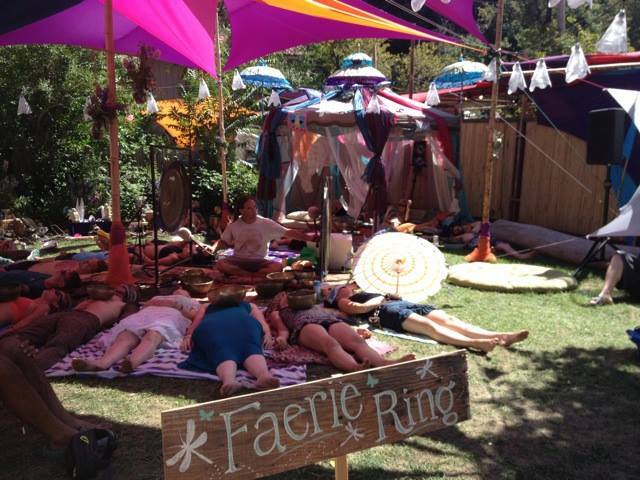 The Sunset Campout Faerie Ring is an interactive heart centered communal environment designed to relax, breathe, reconnect and experience a little Sunset Campout magic. 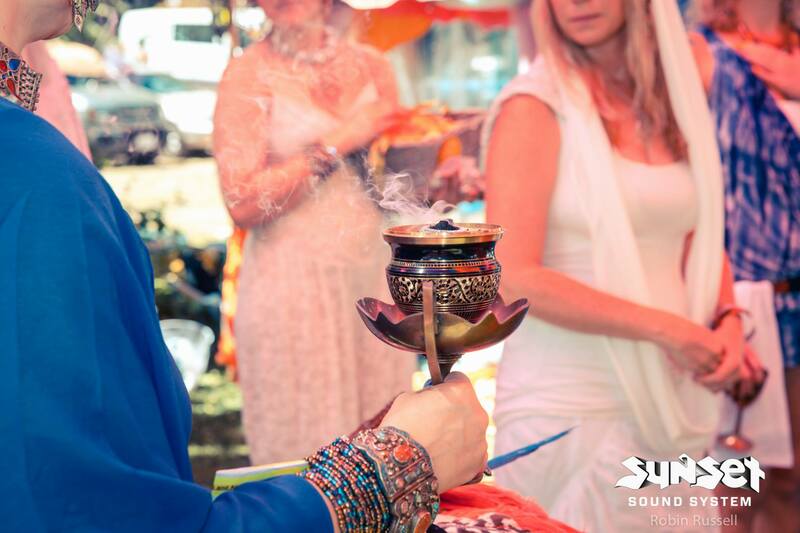 Throughout the years, the area has evolved into a space hosting yoga, meditation, sound healing, creative conscious workshops, ceremony and more. 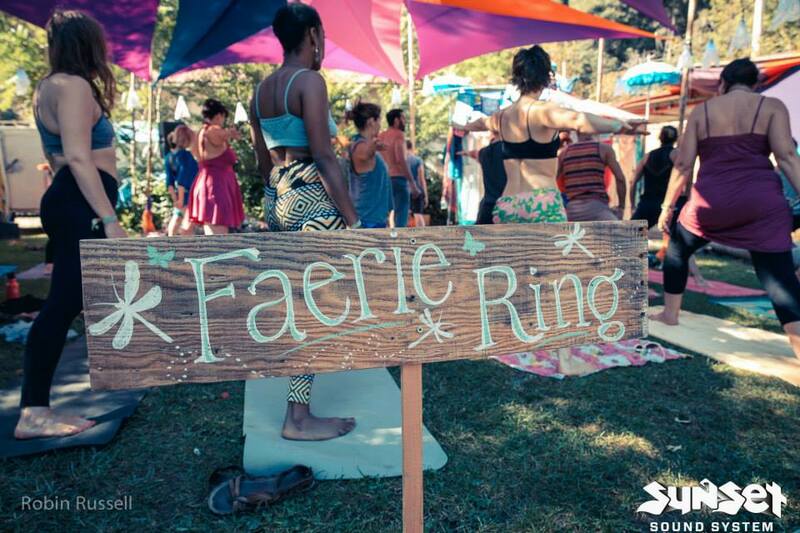 As creators and hosts of the Faerie Ring, altars and workshops, if we aren’t on the dancefloor, come find us in the Faerie Ring, on the lawn across from the lodge, for a wide range of conscious workshops and activities. Below are list of activities planned for the weekend. For the music line up, artists, things you MUST KNOW, directions and more information on Sunset Campout please be sure check out to the website. Join our Sunset Campout crew for opening ceremony to reunite and connect with the elements. Shaman Durek, Living Fae, Anna Scott, Lois Langevin-King, Ursula Young, Bali Young, Alexandra Sargent, Lacey Patterson, Jamie Lynn Pitman, Julianna Maria, Krystal Pinon, RayRay, Silver Lucy, Galen, Solar & Crew with Special Guest Danny Goldberg on Gong. The Journey of Obstacles [Shaman Durek]: Take a journey with Shaman Durek to connect with levels of Self. Dive into the subconscious and meet head on with different aspects of yourself. First meet the guide, which is the heart, then face your fears and meet the hero. After you learn the lessons you will become the teacher of the things you went on the path about. 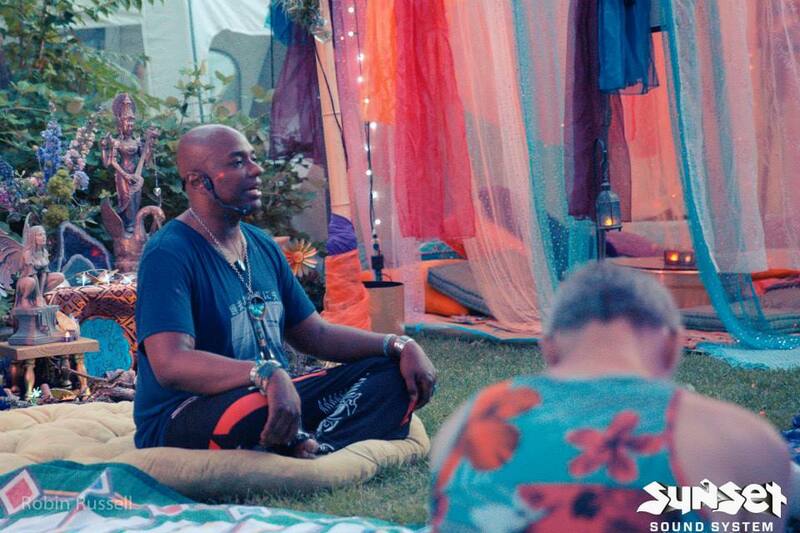 The Sacred Gift [Shaman Durek]: Shaman Durek will lead you on a meditation, then discuss being a nomad and what being in nomadic love means for our future now. After the discussion, he will guide you through a group exercise and finish with a closing breath. Crystal Bowl Sound Meditation [Jessica Neideffer]: Crystal singing bowls work with our intention to accelerate this healing process. Based on Vedic medicine we work with the notes of the musical scale. When sound is projected with intention into the dis-eased area correct harmonic patterns and vibrations can be restored. 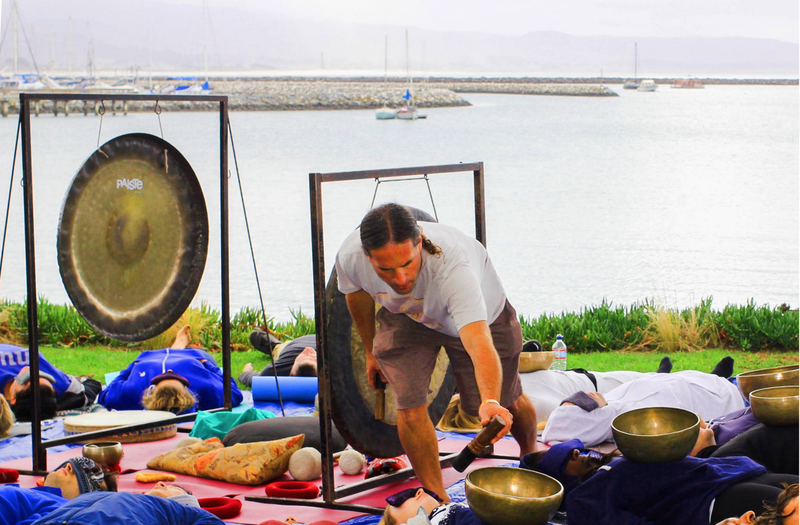 Sound Immersion Experience [Danny Goldberg]: A restorative sound healing with gongs, Tibetan bowls, flutes, chimes and ocean drum to guide you into a deep meditative state. Through the vibrations of Danny’s collection of instruments, you experience an inner calm and deep relaxation that enables you to journey within and center. 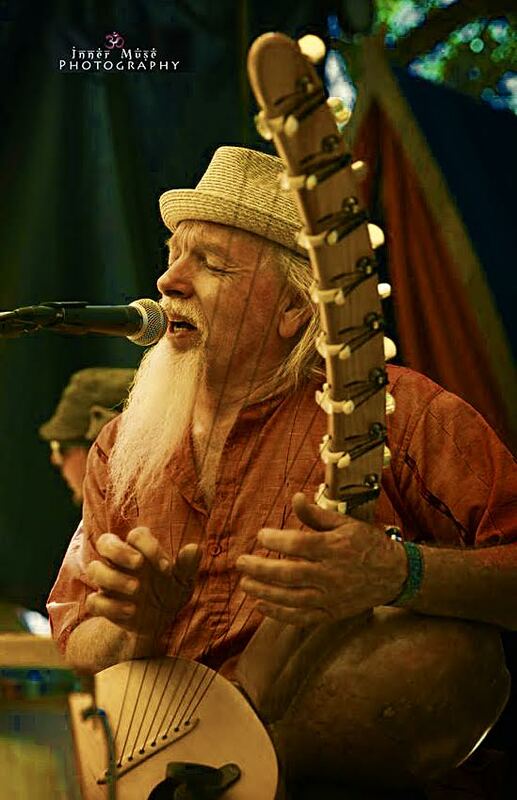 Chakra Balancing & Sound Immersion Experience [Living Fae & Danny Goldberg]: A Chakra Balancing with vibrational sounds and deep heart expansion followed by Danny’s Goldberg’s Sound Immersion Experience with gongs, Tibetan bowls, flutes, chimes and ocean drum. This experience includes essential oils. 432Hz Healing Soundbath [Torkom Ji]: A vibrational magic carpet ride through the harmonic tones and frequencies of the universe. Lay back and receive ethereal sounds as Torkom channels vibrations through his synthesizer with vacuum tubes tuned to 432Hz. This one-of-a-kind healing experience is designed to give the body and mind a full reset, and deepen your weekend experience. Original World Fusion Music [Timo Beckwith]: Original World Fusion Music by Timo Beckwith featuring exotic trance vocals, Shruti Box, Gourd Ennanga, Birimbau, Dunbeck, Pandiero, Darbuka, Flute, Frame Drum and Balaphone. Taking you on a soulful musical journey that can range from soft and subtle to intensely power jammin primal! Sunday Night Movies: Wind down, get cozy and chill out to a collection of independent, counter culture and classic films specially selected by the Sunset Campout crew. Faerie Tales & Faerie Rites [Living Fae & Pixie Pam]: Join us for tea and stories about how we work with Faeries and magic. 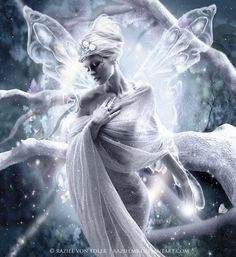 Followed by a meditation and offering of energy to spark the seed of your connection to the Faerie Realm. Strengthen your faerie sight and integrate with Faerie and Earth energies to awaken ancient wisdom, guidance, creativity, wild playfulness and an indigenous heart. Receive your Faerie name. 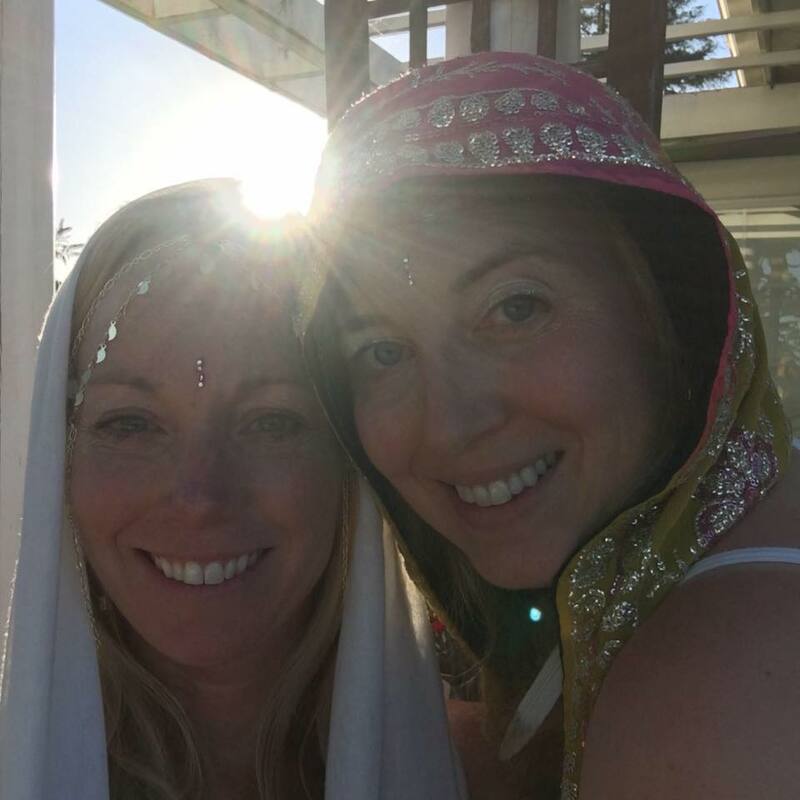 Despacho Ceremony [Pixie Pam & Tara Samiy]: This gratitude ritual will allow us to thank all that we are grateful for in our life now and to come. Set your intentions for your Sunset campout experience to be filled with gratitude, love, happiness and more. We will create a larger despacho for the Sunset campout community for all the laughter, dancing and magic we will have and then create individual despachos for personal honoring. All materials will be provided. The Shift – A Cacao Ceremony [D’ete Blackshire & Veronica Elizabeth]: The cacao ceremony offered on Friday night of the campout will launch festival tribal members to the heights of ecstatic love setting the tone for a weekend of joy, creative expression, and tribal unity. Supported by the sacred wisdom of cacao, D’ete offers a practice in the medicine and skill of embodied alchemy. We will discover the sticky places of resistance to being love within our bodies and release fight by taking action upon awareness for a deep integration. Veronica will lead meditation journey and breath guidance to offer centering for the ceremonial work. Let’s step into this anticipated weekend by blowing our hearts open, freeing our minds, and shift! 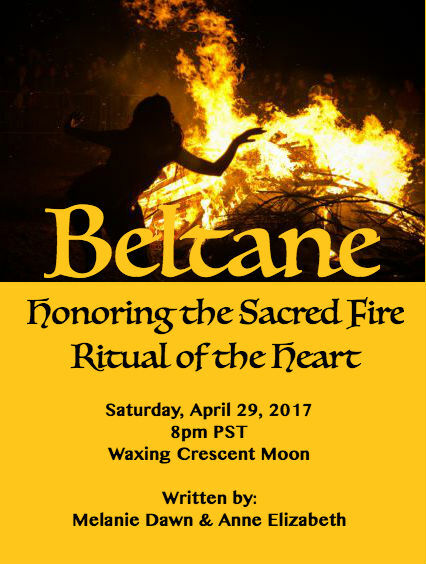 Please, go to www.burnthemystic.com or she-shaman.com for preparation guidelines and information on our ceremonial cacao and the mind, body, soul health benefits. The Alchemy of Life with Nature’s Gifts [Jessica Choate]: We will talk about capturing the essence of healing natural remedies for self love of a more balanced life through the alchemy of tinctures, elixirs and other useful ways to benefit the healing properties of earth’s gifts. 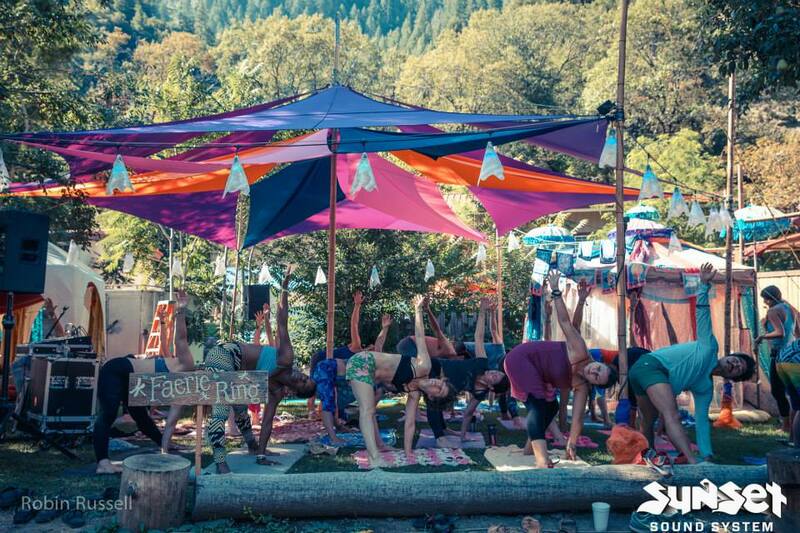 Feather River Flow [Alexandra Sargent]: Start your sunset campout experience with this intermediate level hatha/ vinyasa based sequence. This class will be focused on calming the mind from all the excitement for the weekend, and engaging the body through a strengthening and awakening flow. Prior yoga experience recommended, simple twists and gentle backbends included. Bringing a block or towel is recommended. Yoga Mind, Spirit, Body [Alexandra Sargent]: Yoga is a technique for arriving in the present moment. The very moment you focus your attention back into your body and breathe, you begin to experience a deep sense of stillness. Influenced from the teachings of vini-yoga, this gentle sequence will involve less physical strength, and more focus on simple movements and breath control. A block or towel is recommended to bring with you. Fun Flow [Zalia Aliriza]: Wake up easy and get moving in this one hour, all levels, flow class, that will guarantee you’ll be ready to hit the rest of the day with an open heart & a big smile. An invigorating combination of light workout and deep stretch, you’ll be encouraged to explore a variety of postures, link breath and movement as you stretch and awaken. Mystic Vinyasa Flow [Erika van Gemeren]: We will journey into our hearts and move our bodies from this space so that we will feel a deeper connection to our own selves and all the beings on this planet. We’ve all had mystical experiences, a sense that one cannot adequately describe the richness of the experience, we’ve had feelings of deja vu or feelings like you’ve know someone in prior lives, that’s because we really have been with each other infinite amounts of times. Our planet is awakening and we are the ones they have been waiting for. Let’s do this for all! Yoga Eye Flow [Kim Abels]: Yogi Eye Flow is a Vinyasa Flow Class that creates the synergy of internal focus and release of mind. Using the movements and continuous focus of breath, you will find your own flow. Maintaining strength and balance will come naturally with each transition and hold of poses. Music intended to take you outside of your mind to allow no judgement of the practice. Yogi Eye Flow will leave you feeling back to your self with some fresh skin, restore everything underneath the flesh & capture your true spirit. Gentle Yoga [Cara Smith]: 75 minutes of a gentle yoga flow, a combination of Hatha yoga with the idea of restoration in mind. You’ll leave the class feeling both relaxed and energized. Ida Feshangchi is a tarot reader and Reiki practitioner with 12 years of experience in the metaphysical sciences and healing arts. 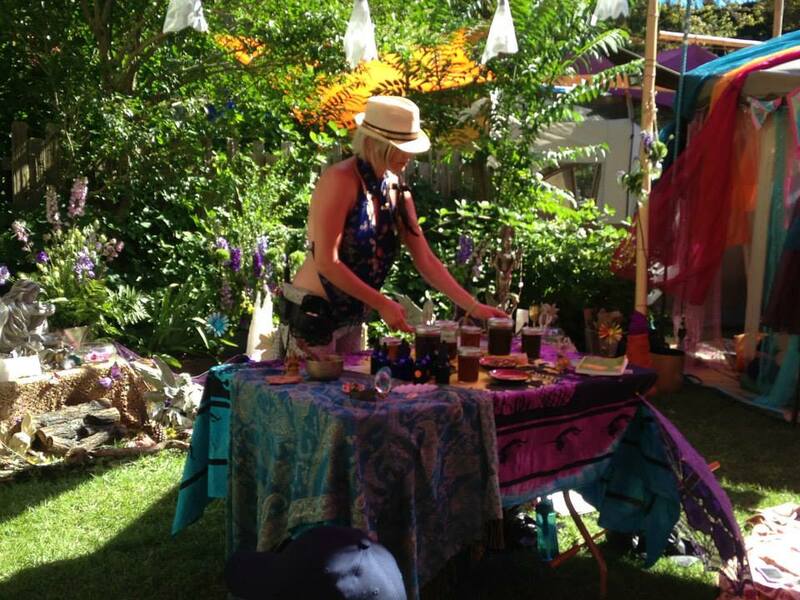 She will be available for readings Friday-Sunday from 1-5 pm. Come by and sign up for a reading. 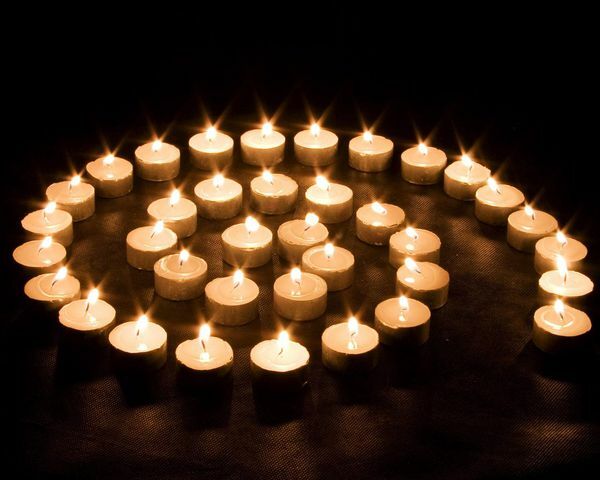 Time for renewal of life with light, love and hope. We’d like to take this moment to express our deepest of gratitude for taking the time to read what inspires us. You are a great blessing! May the Solstice and the return to the light bring you many magical blessings, love, peace, prosperity and happiness. Sprinkling glittering love, light and winter magic faerie dust over all your holiday dreams and wishes brought to you on the wings of the fae. As we move toward the last portion of the year, it comes the time where we put our focus on giving thanks. Hopefully you are someone who counts your blessings on a daily basis. There are so many blessings to show gratitude. Life is a blessing! And there is much meaning and purpose to life when we sit with our gratitude on a daily basis. With our gratitude comes a sense of humility that allows us to appreciate and not take our lives for granted. It can be easy to fall out of position sometimes with one small swoop of the ego claiming hurts and wrong doings, but with a clear mind and open heart we can accept what life has gifted us, regain focus and Be Thankful. Now fill your heart with the feeling of gratitude. Allow it to open. See a bright green spinning light over it. You should start to feel your heart get warm. If you need to think of someone or something you are eternally grateful for. Thank you! We are so very grateful for your presence. 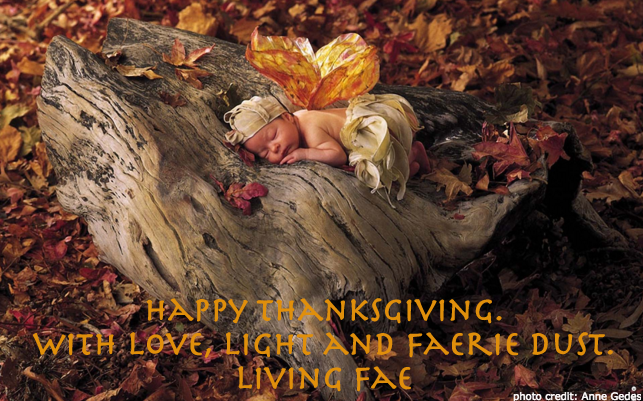 Thank you for taking the time to read our Living Fae post. Thank you for your comments. Thank you for allowing us to share our thoughts and words with you. Thank you for being YOU! You are an amazing person. You are a blessing to this world. A blessing to us. So thank you, thank you, thank you. May you have a bountiful and beautiful Thanksgiving!